Every year we all get together with mum dad's side of the family for a day of festive fun between Christmas and New Year. Maybe 5 years ago we stopped all buying presents for each other and instead started a secret santa, which all worked very well but wasn't quite as exciting as it could be. Last year my auntie had the fab idea of making our secret santas. We all have to make a gift for one person, the materials have to cost less than £5 and it has to be fabulous! Even the children have to make something (with a little help from their parents). The results were amazing, a seriously creative family! So this year the stakes are high. I can't post about my Secret Santa yet in case the recipient is reading so in the meantime I thought I'd write about my dad's recipe for his secret santa (this is a dad whose only job in the kitchen is normally washing up!). 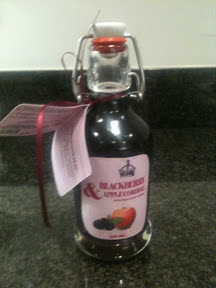 I have been assured though that he did plenty of research to find a recipe for blackberry vodka. Back in the autumn we had picked lots of blackberries which I posted about here and so both of our freezers have a good stock of blackberries. To make blackberry vodka you need to start by weighing the blackberries. You then weigh out the same amount of sugar out and put them in a bottle or kilner jar covered with your vodka. Seal it up, give it a good shake and leave it somewhere dark and cool to mature. Ideally you need to leave it for at least 3 months, giving it a shake every week or so. 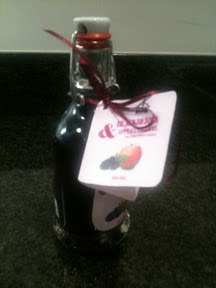 You can then sieve out the fruit and pop in a bottle with a beautiful label. The jury is out on whether the fruit is tasty or not once it's out. Some have suggested serving it on ice cream and others say most of the flavour has gone so bin it. I say give it a taste and if it tastes good then eat it! Here is the vodka maturing. 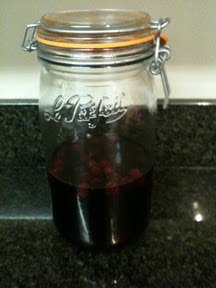 You can see the blackberries have already started doing their magic as the vodka has changed colour. Here are the finished product decanted into a bottle with labels added. Incidentally at uni I used to regularly flavour vodka with sweets and chocolates. It sounds a bit odd but I tell you Mars bar vodka is amazing! Think baileys with a caramel flavour and a bit of a kick. Fab for making cocktails. Lots of sweets work, polo mints, skittles, pear drops. Pick your favourite and experiment. Just pop the sweets/chunks of chocolate in the vodka and give it a shake. I never used to leave it anywhere near 3 months. Maybe a week or so. Shaking every day. I haven't done it for a while though but give it a go and it's done when it tastes good! The sweets/chocolates virtually disappear so there shouldn't be a need to filter it, maybe just sieve and lumps out. This looks great!I like your labels too. I love the way you experimented with sweets and chocoloate in vodka too, who knew?